The diagnosis of a life-limiting illness is devastating. It creates emotions, issues and anxiety unequal to almost anything else in life. It’s all too easy to slip into the “comfort” of denial, pretending that if the issue is not discussed, it will fade into the background. Nothing could be further from the truth. Avoidance can complicate the situation. In fact, most of our families say they wish they had called hospice sooner. It’s important to understand hospice life expectancy: Hospice is appropriate for those who have been diagnosed with a life-limiting illness with a life expectancy of 6 months. In fact, it’s vital to have this discussion about advance health care decisions long before a crisis arises. We also understand that for many families, it is a difficult discussion to begin. We hope this complete family discussion guide will help you start the conversation. Who has been responsible for helping your loved one seek care? Do close friends need to be a part of the conversation, or is it better to keep it private among family members? These are some of the questions you should consider. It’s also important for families and patients to have the information needed to have a productive discussion. This may involve speaking with physicians, hospice workers or religious/ spiritual leaders. An advance directive legal documentation that provides written instructions about your health care if, for some reason, in the future you are not able to speak for yourself. It’s imperative to have one so that you or your loved one’s wishes will be made known before the disease progresses; it’s often impossible to have a comprehensive discussion when patients are sick, in pain or sedated. Therefore, we encourage every family to understand the magnitude of an advance health care plan. Why is an Advance Directive Important? While nearly 80 percent of Americans state that they would like to die at home, almost 75 percent don’t. 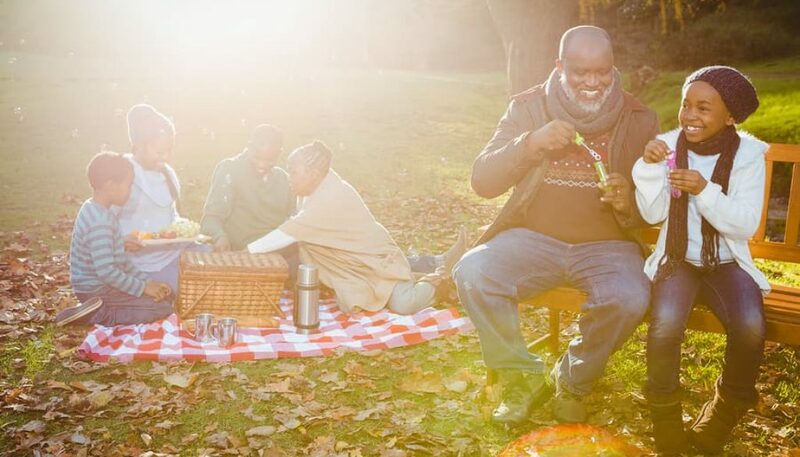 Those without advanced care planning—such as an advance directive or a living will—are moved an average of three times in the last weeks of life. Less than one-third of adults have an advance directive. 80 percent of Americans don’t want their life extended by machines. Over the last 15 years, the use of mechanical ventilation in the last 90 days of life has dramatically increased. You can find answers to some frequently asked questions about advanced directives through the NC Secretary of State’s office. We suggest creating a list of topics to discuss before the actual meeting with your family members and care team so you won’t forget anything. Will our loved one be able to ride in a car? How should he/she be transported? What medication and supplies does hospice provide? Will he/she be able to keep their physician? Is there an on-call nurse we can contact in case of an emergency? Where will he/she be treated? Can treatment be received at home? What ethical dilemmas should we be prepared to face? What is our hospice benefit? Is it paid for by Medicare/Medicaid? What can we reasonably expect for our loved one’s quality of life? What will happen if our loved one is unable to eat? What pain management treatment will be available? In addition, it’s also a good idea to take notes. During meetings, you’re often faced with a lot of information at once, and it helps to have something you can refer to later. You should also ask if there is a hospice end-of-life brochure available. With board-certified physicians, nurses and counselors, we have provided compassionate hospice services for thousands of area families. These professionals have earned specialized certification in caring for hospice patients. We are the only area hospice with full-time physicians on staff. 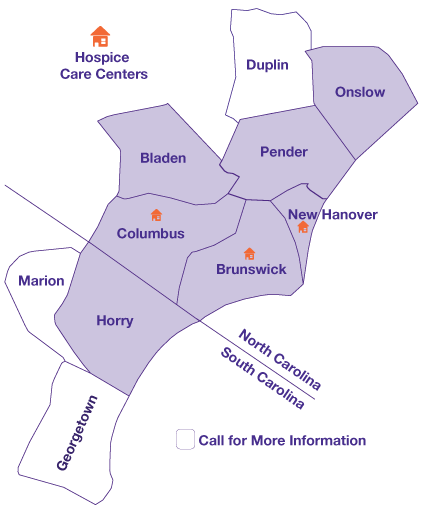 With multiple levels of care, exclusive hospice care centers, and specialized programs for veterans, you can see why we are the hospice of choice for southeastern North Carolina.